Perla Audio has come a long way since I first encountered the company in Las Vegas some years back. Specializing in virtually holographic imaging, Perla's PRS-2 speakers ($5500/pair) did quite well with the family-owned company's USB DAC ($3900), monoblock amplifiers ($12,500, presumably for the pair), phono stage ($5500), and integrated amp ($9500). I assume the monoblocks and integrated were not both in use at the same time, but I wasn't told which I was hearing; what they did use was a Paradox Custom Pulse turntable, equipped with a Denon 103R MC phono cartridge mounted in a Paradox Pulse cartridge body. On the Muddy Waters Folk Singer LP, I experienced an astoundingly high, holographic image and lots of dynamic contrast. The timbre of the guitar was excellent. Switching to full-range classical, we threw all caution to the wind with Johann Strauss, Jr.'s extremely dangerous, banned-in-Kansas Lucifer Polka. Once I got over laughing at the ridiculousness of it all, I realized that the system conveyed the waltz's broad strokes quite well, if not all of the air, instrumental finesse, and overtones on the recording. All cables were also Paradox although prototypes for the new Pulse line of cables! The entire turntable arm (tonearm by Abis (SA 1.2) but modified by Paradox) and cartridge was Paradox Pulse R Sapphire line contact. 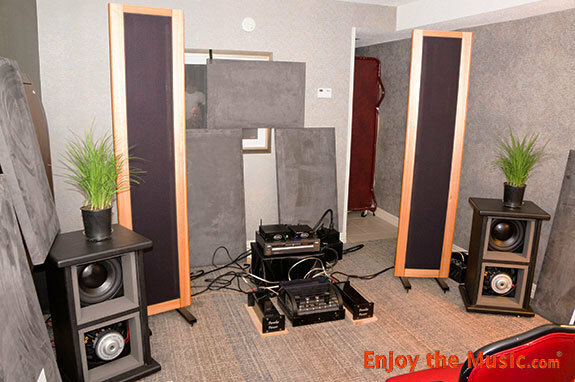 Capital Audio Fest (CAF) 2016 brought some praise for Paradox products. 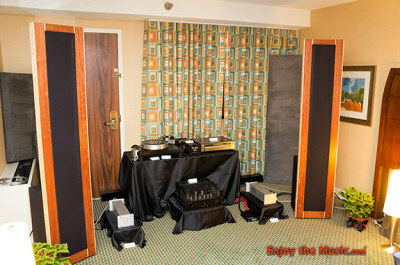 ​Greg from GT Audioworks set up the room and ran the show I was just a bystander as I could not actually be there. Greg makes a great speakers and like many others once you listen to Paradox products you are a customer for life. My customers tell me all the time "you can pay tens of thousands more but you can't get better sound". If you click on this text you will be directed to what Art Dudley had to say about the GT Audio Works and Paradox. Last year I stumbled upon New Jersey’s GT Audio Works and its fabulous large panel GTA 2.5 speaker. 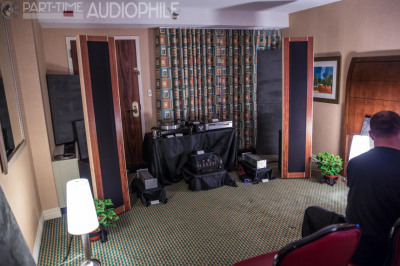 It was one of my “Best of Show” picks, noting that the speaker’s sound was “…delicious to the ears.” The speaker was such a delight that I pegged GT Audio Works as my first official room-stop of CAF 2016. There I found the company’s enthusiastic owner (and speaker builder) Greg Takesh and his new GTA3R full-range planar magnetic / ribbon tweeter speakers. Normally priced at $9,000 per pair ($7,200 show special), this new iteration of the GTA speaker has a new straight panel design without the GTA 2.5’s built-in 10-inch woofer drivers. Instead, GT Audio Works is pairing the GTA3R with Sound Insight’s dual 12-inch driver SI-200 open-baffle poweredsubwoofers (which retail in the realm of $6,000 per pair). From the front, the GTA3R looks very similar to the GTA 2.5, sporting a handsome wood framed finish and sleek black grill cloth. But the addition of separate subs (not to mention the SI-200’s room friendly table look) arguably adds a new dimension of tweak-ability for even better bass performance. 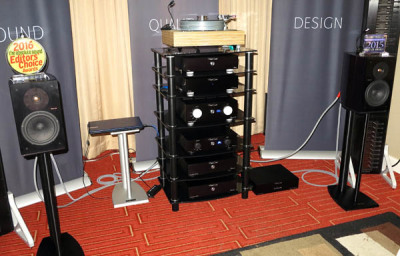 The room’s equipment included Paradox Pulse class A/B solid state monoblocks paired with a Paradox modified CD player, a Hollis Audio Labs MS-3 Music Server, and a Hollis Audo Labs dspMusik DAC. The GTA3R sounded simply fantastic to my ears. Greg and his crew played several tracks including Yello’sElectric Frame and Bernadette Peters’ Blackbird to showoff the speaker’s versatility and range. Imaging and depth of soundstage was infinitely superb. And, once again, I was completely floored by the soundstage’s height and breadth. Highs were super crisp and bass was tight and solidly deep; off-axis listening was excellent to boot. This is a speaker that, for the price, is a total steal. I can’t say enough about the sound (after all, that’s what this is really about, correct?). If you’re not shy about purchasing gear from a small independent builder, then GT Audio Works should be on your demo shortlist. I can guarantee with absolute certainty that you’ll love what you hear. Click on this text or the picture and you will go to linked article. I had an enjoyable afterhours listening session with Shane and Stacy Duffy from Perla Audio. Perla Audio is a family operated company located in Sparks, Nevada. They make a full range of electronics and some speakers with the focus on performance at a reasonable cost and above all, ease of use. Everything is designed to be plug and play. They do all their own design and manufacturing and are some of the most passionate people about their products of anyone I have met. They shanghaied me in front of the elevators while I was waiting to go up to the NFS (Not For Sale) hospitality suite and asked me if I wanted to come to their room to listen. I was not wearing my name tag so they thought I was a civilian instead of VIP (Very Important Press). They wanted to share their accomplishments with anyone they thought might enjoy them. 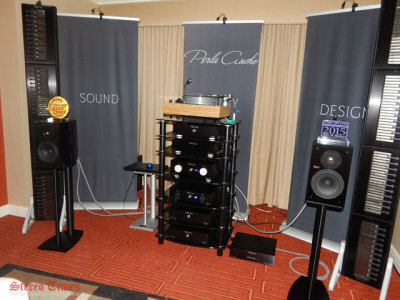 With a full chain of Perla Audio electronics in front of them the PRS-2 ($7,800) speakers rivaled much larger ones for imaging and clarity. Bass quality was especially impressive and vocals were spot on. The planar magnetic columns in the picture are part of a speaker in development. As planned it will have three columns per side (bass, midrange, and tweeter). Shane hopes to have it at the show next year. The speaker will be scalable with the number of sections adjusted. Layer by layer, Shane set the pieces for just one section in my lap and my feet sunk into the carpet. Did I mention that everything they build has massive aluminum employed as part of the case work, not just the faceplates? Inside no effort is spared either. Every component is hand soldered on custom made 24k gold-plated PCB boards using Cardas ultra-pure quad eutectic solder. The new speaker by Perla Audio is the antithesis to their stated core philosophy and mine as well but it was fun seeing the creative process happening and Shane’s enthusiasm is infectious. And therein lays the best part of any show, the people and their passion. The brave hearts who turn their dreams into reality and those who step beyond safe and sane to build the best product they can because they can. It is not the destination that impresses me as much as spirit of the journey. Those planer speakers are just the midrange to their new all out speaker. Not noted is that the front end, Turntable, tone arm, cartridge and all cables are Paradox Pulse! ​Sparks, Nevada-based Perla Audio has come a long way in a short time. Founded only in 2012, the family-owned company has increasingly been generating attention at the major shows. Newport 2016 was a continuation of that trend, with Perla presenting its best-sounding system yet. One correction, he said; "Triode Wire Labs provided the power and signal cables." This is an incorrect statement ALL the power and signal cables were Paradox. Greg Takesh of GT Audio Works took a year off from CAF in 2014 and put that time into R&D, time well spent as the debut of his GTA 2.5 Hybrid Planar Speakers $8995/pr, was sensational. The full range planar magnetic driver uses neodymium magnets and is driven directly without any crossover between it and your amp. A single cap protects a ribbon tweeter, 48" long, same as the mid. Two 10" drivers in a sealed box form the bottom of the sleek cabinet and are driven by a Hypex plate amp, crossing over near 100 Hz, but the Hypex gives plenty of flexibility to match a room or personal tastes. The woodwork is handcrafted and furniture quality, and as these are built to order you get to choose your favorite wood and maybe a contrasting color as well. Right down to the Propeller binding posts and the fit of the grille, the GTA 2.5s got all the details sorted out.Paradox Pulse mono amps $12,000/pr, provided 100 watts, a PrimaLuna Dialog Premium preamp $3199 connected a Paradox modified JVC 1050 CD player and Rich Hollis' HAL MS-3 server, $799, and Danville Signal dspMusik DAC $1500. Paradox Red wiring connected everything, and a power conditioner was tried and rejected as it solved some noise issues but robbed the system of dynamics and clarity. Thinking like a veteran, Greg had ATS Acoustics supply some room treatments, very helpful.